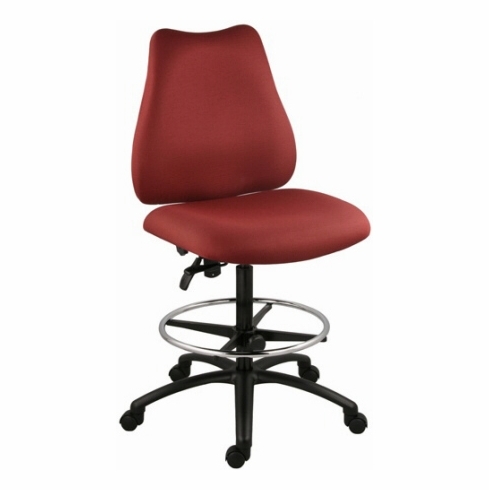 This heavy duty drafting desk chair from Ergocraft is built to accommodate users up to 350 lbs. and is available in your choice of (4) different commercial grade fabrics. Other features on this Ergocraft chair include overstuffed and contoured seat and backrest cushions, pneumatic seat height adjustment, back height adjustment, back angle adjustment, adjustable height footring and a heavy duty steel base with dual wheel casters. Optional adjustable height/width arm rests available for this chair. Meets or exceeds ANSI/BIFMA standards. Dimensions: Seat Size: 21.75"W x 20.75"D x 3"Thick. Back Size: 21.75"W x 20.5"H. Overall: 45.5" - 55.5"H x 21.75"W x 24"D. Weight: 60 lbs. 12 year limited warranty from Ergocraft. This chair normally ships within 2-3 business days from our CA warehouse.